Isagenix Snacks £ £18.00In stock! Order now! Need a delicious and nutritious energy boost? Say hello to Isagenix Snacks! This chewable treat is available in tasty chocolate flavour, or dairy-free natural wild berry flavour. Loaded with protein and other nutrients, these are designed to be enjoyed on-the-go whenever you want. In other words, it’s the perfect hunger-curbing treat! Want to learn more? Download the product information guide here. An important component of the Isagenix Nutritional Programme, Isagenix Snacks contain a balance of high-quality whey and milk or plant based protein, carbohydrates and fat to nourish your body, and chromium to support your metabolism and maintain normal blood glucose levels. A great choice for in between meals and on Cleanse Days. Available in Natural Wild Berry Flavour for a delicious alternative for those on a plant based diet. Isagenix Cleanse Days can be challenging, especially when hunger pangs start setting in and you have a craving for something sweet. If you’re hungry by the end of the day or simply feel like you need a little energy boost, Isagenix Snacks are the solution. At only 15 calories a piece, these protein-packed chewable treats will help you stay satisfied and keep any unhealthy, high-kilojoule temptations at bay. Isagenix Snacks are full of high-quality protein and work perfectly for curbing your appetite, which means you’ll be less tempted to stray from your programme and snack on unhealthy foods. They’re naturally flavoured as well, giving you delicious tastes without the artificial flavours, sweeteners, and fillers found in processed snacks. If you want to lose weight, you need to throw those rice cakes and other flavourless snacks away and satisfy your sweet and salty desires. Isagenix Snacks solve this dilemma. These tasty nutritious treats are what you need to say goodbye to the diet blues for good. In addition to premium protein, Isagenix Snacks contains energy fueling carbohydrates to give you an effective dose of healthy carbs when you need it most. They also feature flax seeds and other natural fibre to aid in healthy digestion and provide you with a little extra energy to power through Cleanse Days. Isagenix Snacks may be small, but don’t let their small size fool you. These little chewy chocolate or wild berry wafers pack quite a healthy punch. Isagenix is new to the UK, but our products are flying off of warehouse shelves. 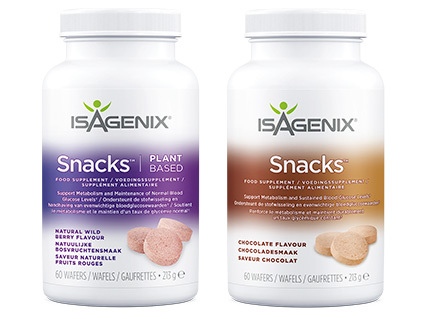 Delivered from our local London warehouse right to your front door, you can order Isagenix Snacks online and wait for them to arrive in just a few days. How Much is a Bottle of Isagenix Snacks? Each box of 60 wafers can be purchased for £32 at full retail prices, or sign up with us (UK’s #1 distributor) and pay just £24 per box! Read Isagenix Snacks reviews from real Isagenix UK customers!